I heart crochet. I have been looking for a little crocheted something to wear this summer. I saw this and absolutely fell in love with the delicate pattern. If only I could afford it. 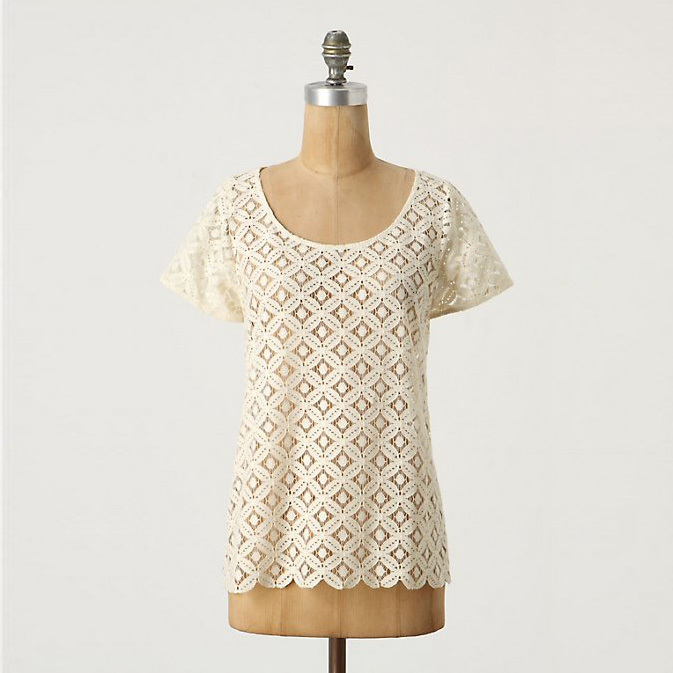 The lace top paired with a dress in this Ruche look reminds me a lot of the Anthropolgie top for a 1/3 of the cost. Um. No. Looks like my grandmother's table cloth. Sorry. I think the lace/crochet thing is lovely, but it doesn't do a thing for me personally. I can't really do the big ruffle thing, either, as it makes me look ridiculous. It's perfect for some people, just not me. :) Here's what I found at Forever 21 for cheaper yet, although not quite the same: http://www.forever21.com/product.asp?catalog_name=FOREVER21&category_name=top&product_id=2070221449&page=1&pgCount=1&size=&sort=np, http://www.forever21.com/product.asp?catalog_name=FOREVER21&category_name=Dailyspecial&product_id=2000012520&page=1&pgCount=1&size=&sort=np, and http://www.forever21.com/product.asp?catalog_name=FOREVER21&category_name=top&product_id=2078967022&page=1&pgCount=1&size=&sort=np. Congrats again on the new baby! Love it! I bought this shirt from JC Penney for a fraction of the cost and it is very similar. Nice for the post-partum period, too!